During the talks that ended on Wednesday, US President Donald Trump and the head of the European Commission, Jean-Claude Juncker in Washington, the parties decided to postpone the large-scale trade war and try to negotiate to remove mutual claims and reproaches. This, of course, does not mean that there will not be a trade war. This means that it will not be in the coming months, since the parties to the conflict, having conducted a powerful artillery preparation and demonstrating their determination to defend their interests, temporarily canceled the battle, which seemed inevitable. But what if they really manage to come to an agreement? Even if not, nothing. It is also good to pull the time, because the current Western politicians are temporary workers who live today and prefer not to look into the future, which is prepared by those who manipulate them. It is worth recalling that both politicians were very skeptical before the conclusion of the talks. In part, perhaps this was part of the "misinformation campaign", in order to increase its chances of success in the course of bargaining. At a joint press conference with Juncker, Trump said that the US and the EU would create "for the benefit of both sides" a working group to address trade problems and assess existing tariffs, and announced the beginning of negotiations, recognizing that "he does not know what they will lead to ". While they continue, the parties agreed not to introduce new tariffs against each other. Trump pointed out that the US-EU trade relations "are already estimated at a trillion dollars - these are the largest trade relations in the world", which, he said, should be strengthened. Therefore, an agreement was reached "to work together to achieve zero duties, zero other barriers and zero subsidies for industrial products, except for the automotive industry." The US President expressed his hope that the issue of US duties on steel and aluminum from the EU countries (respectively 25% and 10%) and European 25% counter-taxes on a number of types of American metallurgical, machine-building and agricultural products " What are we doing". Trump also said that the parties will work "to reduce barriers that impede the growth of trade and services, including chemical, pharmaceutical, medical products, as well as soybeans." At the last moment he stopped in detail, proudly announcing that the EU "will almost immediately begin to purchase a significant amount of soybeans from our farmers, mainly in the Midwest," for which he expressed his personal gratitude to Junker, calling him by name. The secret of this affectation lies in the fact that the Midwest is Trump's electoral base, which acquires special significance for him in the light of the forthcoming midterm elections to the US Congress. The US president said that this step "will open markets for farmers and workers, increase investment and lead to greater prosperity" of the EU and the US, "will make trade fair and more mutually beneficial." The same mill is pouring water and the EU's consent to purchase from the US more liquefied natural gas (LNG). This has nothing to do with European energy projects with Russia, above all Nord Stream-2, under which Americans are getting under way, although they are well aware that their liquefied natural gas, more expensive and "political," to meet the needs of Europe completely is not enough. According to the owner of the White House, the parties agreed to "begin a close dialogue with respect to standards in order to facilitate the trade process, remove bureaucratic obstacles and significantly reduce costs," and "join forces to protect American and European companies." Juncker, in turn, promised that the parties will refrain from introducing new reciprocal duties while negotiations are under way to resolve bilateral trade issues and "until one of the parties terminates these negotiations." During the meeting with Trump in the White House, the head of the European Commission indicated that Washington and Brussels should "focus on reducing duties, rather than increasing them." Juncker reminded Trump that the EU and the US "are close allies, not enemies, and should work together," and Trump responded by repeating his idea on Twitter the day before on Twitter that there should not be "no tariffs, barriers and subsidies." In his favorite Twitter, the US president said that "the work on the documents has already begun, and the process is moving quickly." According to him, the parties "came to a very deep understanding, all were supporters of the absence of duties, barriers and subsidies." Noting that during the talks in the White House, Americans and Europeans "made a breakthrough" in trade issues, Trump admitted: "Nobody thought that it was possible!" US Secretary of Commerce Wilbur Ross in an interview with Fox News revealed the main reasons for the success: the parties did not put forward preconditions for each other, were pragmatic and prepared well for the talks in Washington. Speaking at the Washington Center for Strategic and International Studies (CSIS), Juncker noted that for a number of issues Europeans still agree with the Americans. For example, in the fact that much in trade relations must be changed and that there are "excess steel production capacity." He stressed that the EU is pleased with the agreements reached on this matter with the United States, Canada and Japan. In order to visually present Trump an alternative to the failure of trade negotiations, Juncker presented to the US President a photograph of the military cemetery in his native Luxembourg, where the most dashing and steep American military leader George Patton, who died shortly after the end of the war in occupied Germany, was buried with the inscription: "Dear Donald, let's remember our common history. " 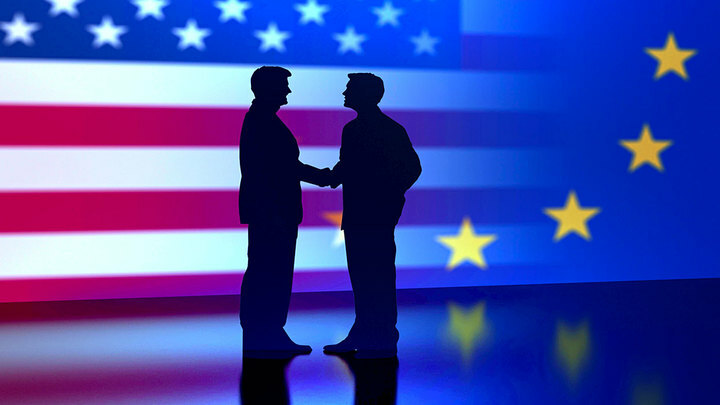 The removal of the threat of an immediate large-scale trade war between the US and the EU aroused a favorable reaction in countries and international structures, especially those interested in global trade. German Economics Minister Peter Altmeier said about the results of the Washington talks in his Twitter: "The progress that will avoid a trade war and save millions of jobs has been achieved! Great for the global economy! ". His enthusiasm can be understood - in the case of a full-scale transatlantic trade war, the FRG, with its pronounced export economy, will be the first and main victim. Kristin Lagarde, Managing Director of the International Monetary Fund (IMF), expressed his joy in connection with the results of the talks in Washington in a special written statement: "I'm happy to know that today the United States and the European Union have reached an agreement on joint work to reduce trade barriers and strengthen the WTO together with other partners. " Lagarde stressed that "the global economic system can only benefit when states take constructive part in resolving trade and investment disputes without resorting to exceptional measures." So, let's sum up. First, there will be no full-scale trade war between the US and the EU. Secondly, between the parties to the trade conflict, difficult negotiations begin, the success of which is not guaranteed. Thirdly, the EU and the US, holding the economic "tobacco apart", otherwise feel themselves if not already allies, it is still - in comparison with other major international actors - the closest poles in the global world. First of all, in political, ideological, military and cultural relations. Therefore, they will try very hard to come to an agreement. What happened in Washington reminds the United States of China's economic and trade cooperation with China, especially the consent of the Europeans to give a "bribe" to Trump through the example of the Chinese, who have the biggest trade imbalance with Americans, by agreeing to purchase soybeans and LNG. However, China does not go beyond the minimum concessions of the US to China, all attempts by Trump to tear him apart at a major Beijing are being stopped by effective countermeasures. Something similar, but in a more cordial manner, will apparently take place from the owner of the White House and the Europeans. Soon we will see it.